Leela is getting a little demanding lately letting me know when it’s her play time, walk time, and meal time. I can’t blame her, I feel like there is not enough time for everything I want to do this week. 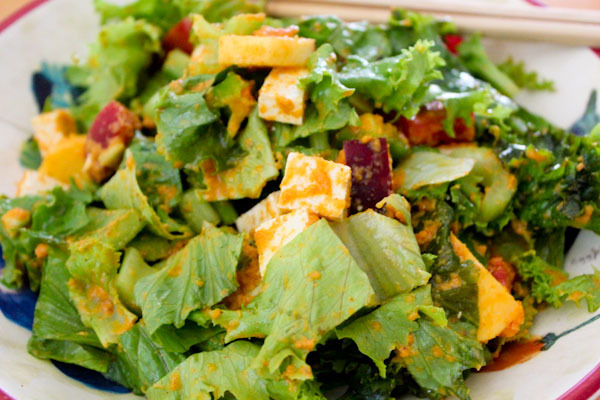 But Friday is getting closer and I did create a fun new version of my favorite carrot miso dressing. This version has a creamy and nutty kick to go with the zesty ginger, it has a powerful flavor on it’s own and could be an amazing dip or spread as well as a salad. It’s also oil free and sugar free and packs a savory, smokey flare to add a unique flavor depth to fresh veggies and fruit. 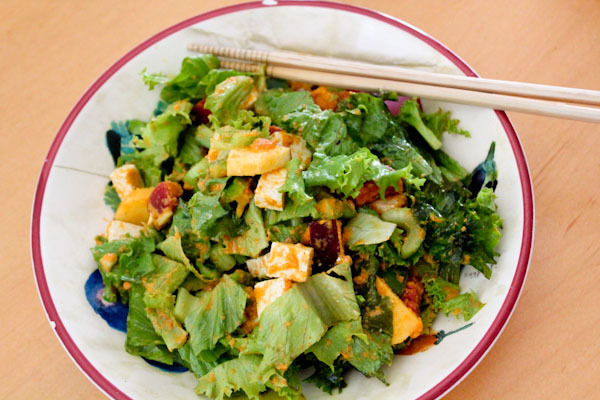 Yes, that’s chopped apple and non-GMO tofu in this meal salad, I was keeping it simple for dinner. And simple was delicious with a fiery, smokey flare. 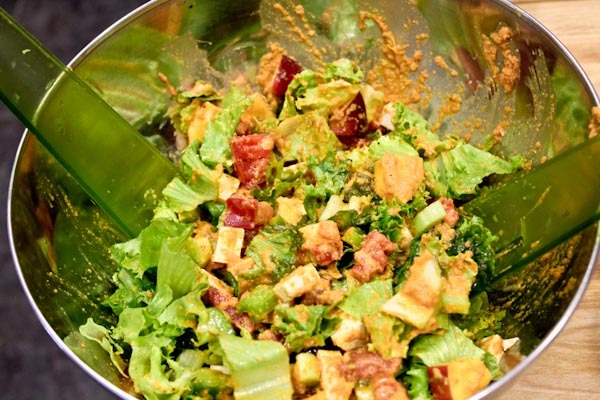 Enjoy a loaded salad with this dressing and keep the good things going for the week. Great color on that sauce/dressing! I will be doing some carrot dishes very soon! I have been craving them! 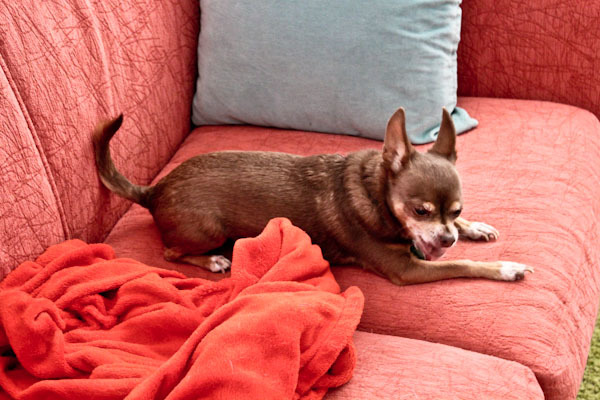 Coco has been acting the same way. She let’s me work for thirty minute increments and then demands some play time. I swear she can tell time. Haha, true on food. And dogs really do know time, mine get really antsy around walk time every night. 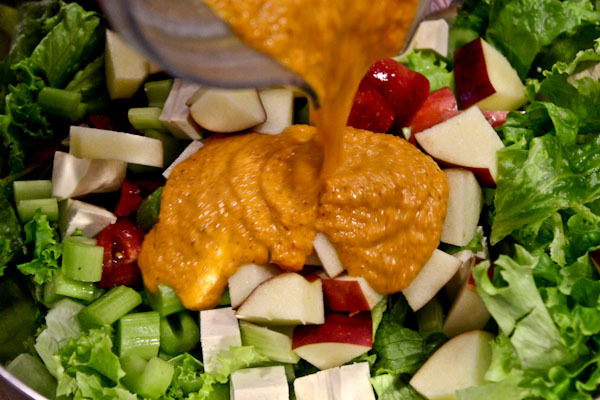 I feel kind of lazy this week, like it would be okay to make this carrot miso dressing and just dips some apple slices and celery slices in it. And call it lunch. Maybe with a protein shake? Leela is so cute on the couch. Not only do I have my 2 dachshunds, but my parents are out of town which makes 3 yappy, insane dogs. Time to take them for a walk! The dressing makes a great dip too. :-) I’ve been there with dogs, we’ve had up to four in the house at a time while dogsitting and walks are chaos!